My town’s Junior League just started planning a Dr. Seuss party for our local library. With Dr. Seuss’s birthday coming up on March 2nd, we thought it would be a fun way to celebrate and raise money for new books. 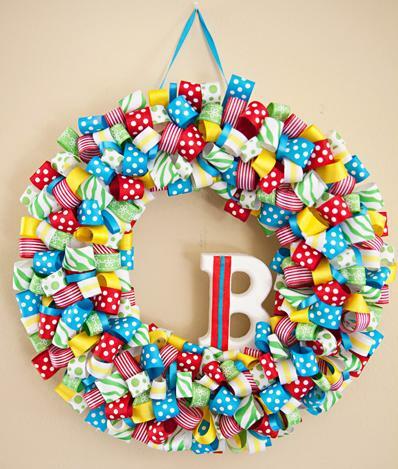 I’ve been looking for fun Seuss-ical decorations and party ideas and thought I’d share some of my favorites. I don’t know which I love more, Courtney’s gorgeous fireplace and built-ins or her hand drawn and hand-made Seuss decorations. So cute! 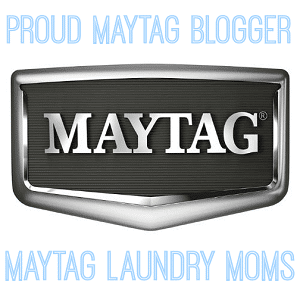 She’s got a lot of other great pics and ideas at Nesting Instincts. The girls over at Hostess with the Mostess threw one of the coolest Dr Seuss parties I’ve found. From the adorable hand-made Seuss-ical wreath to the amazing cupcakes and decorations, you have to see their Seuss Party! 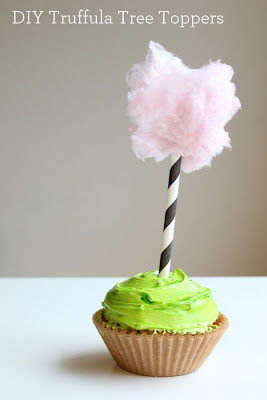 This Truffala Tree Cupcake from The Lorax was made by Colleen at Swash + A Sprinkle. I love it! 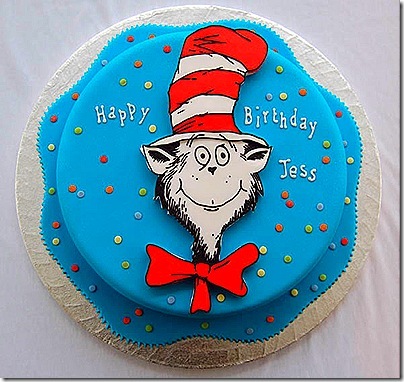 Look at this amazing Cat in the Hat cake. 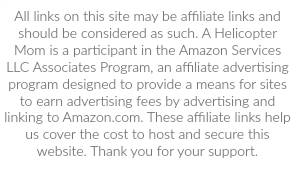 It’s from Cake Lava and is so cool! They have some sculpted cakes that are just unreal – from Hello Kitty and Batman to real animals and objects. 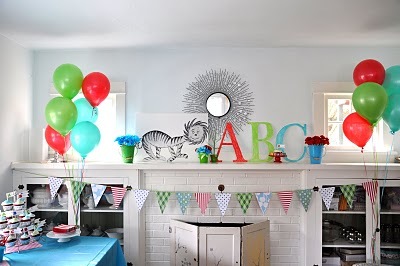 Andrea over at Catch My Party has thought of everything when it comes to Dr Seuss parties. From the favors and decorations to the cake and even the birthday outfit, there something Seussical everywhere. It’s just adorable! 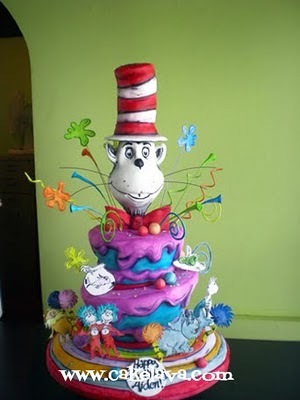 Here’s another Cat in the Hat cake that’s just incredible. From the water in the shower to the perfect Cat shape and detail, Planet Cake has some amazingly talented designers and cakes for every occasion. 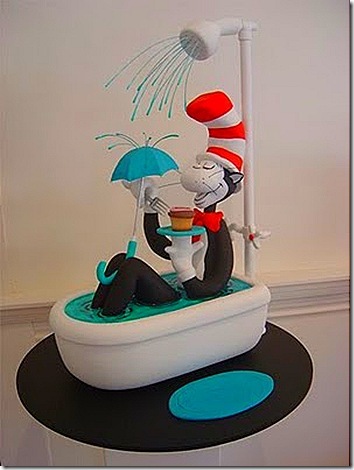 Another amazing Cat in the Hat cake, from Cakes Beyond Belief. The Cat is perfect! This would be so cute at a birthday party. Adorable Truffula Tree Cake Pops from Bakerella. These are so cute! 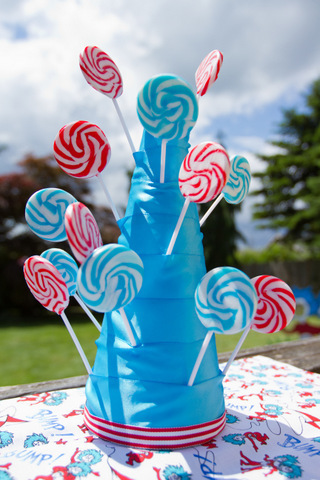 I love this fun and funky lollipop tree from Catch My Party. 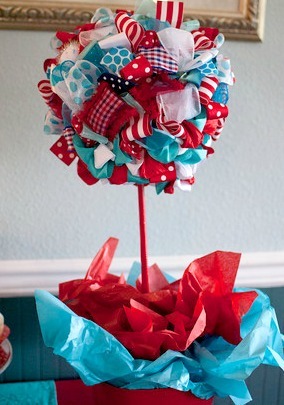 It looks simple enough to re-create, but is cute and so Seussical! beautiful!! the cakes are amazing and i love the truffula tree cupcakes!